Jambo Everyone: A Day to Celebrate DAK! A Day to Celebrate DAK! Today is Earth Day AND the 17th anniversary of the opening of Disney's Animal Kingdom. Disney chose to open the park on Earth Day to signal the company's intention to enter the world of conservation, and they have certainly succeeded in that goal so far. So we thought in order to celebrate both events we would have a quick tour of some the park's most threatened species. 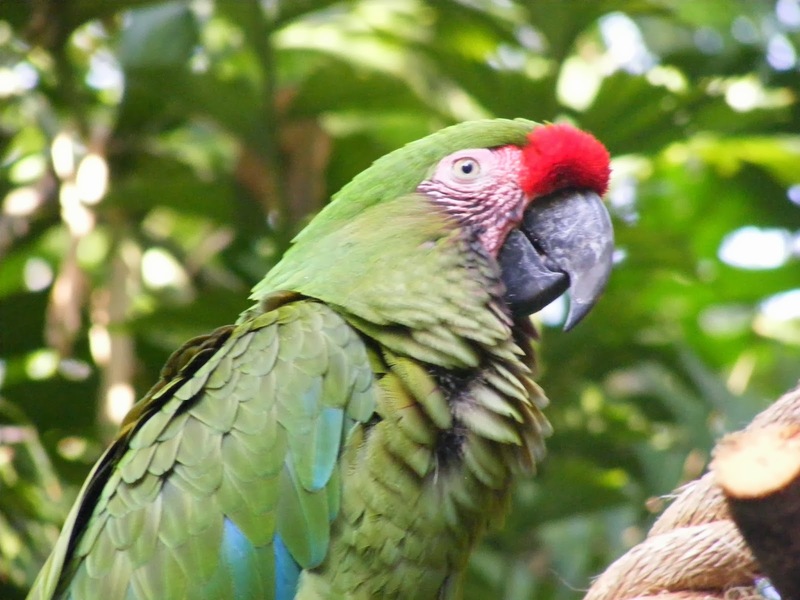 As we enter through the single most well-themed entrance area in any Disney park, the Oasis immediately greets us with lush vegetation and a wonderful collection of exotic animals from all over the world, including this Great Green Macaw. Thanks to habitat destruction, and the horriblly alarming number of deaths due to the pet trade, these guys are struggling in the wild. A real tour of Discovery Island is something too many guests miss, as they make their way to one attraction or another. But the Island is filled with miraculous animals, including the incredibly fun to watch Cotton-Top Tamarins. This species is listed as "critically endangered" and DAK is doing everything they can to help them, including building a sweet new habitat. Bare left at the Tree of Life and we make our way towards the beating heart of Disney's Animal Kingdom, Africa and the Port of Harambe. The real Africa is home to many different gorilla species, most of whom face existential threats. At the Animal Kingdom we find the Western Lowland Gorilla, which faces the perils of deforestation, poaching and deadly diseases. These majestic animals should be near the top of your touring plan for any trip to the park. Besides being incredible to observe and photograph, they also live in a stunningly gorgeous habitat. The most endangered species found in the Asia section of the park may also be the newest. Only in the last few months have we been able to view the critically endangered Sumatran Tiger at the Maharajah Jungle Trek. With only 300-400 animals left in the wild, this is a species which very well may go extinct in our lifetime. It may be left to zoos, like the Animal Kingdom, to keep them alive. And like a warning of what could happen if we aren't careful, our final stop is the home of the planet's most popular extinct species, and no dino is more popular then that king of all dinos, the T-Rex. Dinoland USA just happens to be the home of a full-scale replica of a Tyrannosaurus Rex skeleton. You can see it just to your right as you enter the plaza of the Dino Institute. So let us all wish Disney's Animal Kingdom a happy birthday and all of us a Happy Earth Day. Let the good work at the Animal Kingdom, and by zoos and conservation organizations the world over, continue. Join Warden Wilson Matua's Air Rangers!